Faber Piano Adventures. Educational, Method. Softcover. 64 pages. Faber Piano Adventures #FF1078. Published by Faber Piano Adventures (HL.420171). The 2nd Edition Level 1 Lesson Book introduces all the notes of the grand staff, elementary chord playing, and the concept of tonic and dominant notes. Students play in varied positions, reinforcing reading skills and recognizing intervals through the 5th. Musicianship is built with the introduction of legato and staccato touches. This level continues the interval orientation to reading across the full range of the Grand Staff. The 5-finger approach is presented here in a fresh, musically appealing way. 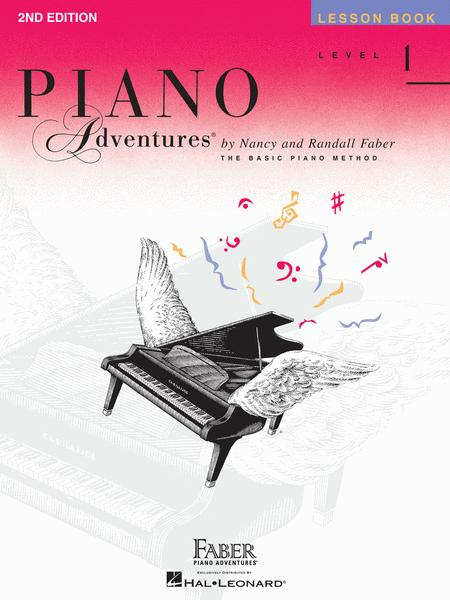 Piano Adventures has set a new standard for a new century of piano teaching. It is fast becoming the method of choice at leading university pedagogy programs and major teaching studios around the world. But more importantly, Piano Adventures is bringing smiles to the faces of thousands of piano students. It can do the same for your students. I teach the Piano Adventures series to primary school students, and it's always exciting when we get to this Level 1 book. The pieces are melodious and fun. As in the primer books, there are fabulous duets for the teacher to play along with the student. This book--and the entire Fabar series--is engaging and motivating for students while providing ample practice of technic. A wonderful way to meld theory with practice. bought to introduce young niece to piano. These are perfect for beginners to teach them everything with real notes on the staff not letters.